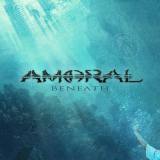 Melodic/power metal has not been on my radar very much in 2011, so I decided to check out the latest from Finnish metalers Amoral. They have been playing a relatively generic brand of melodic power metal since their 2009 release Show Your Colors, in which the band completely changed their style after releasing several solid tech death albums. This album does build on what the band accomplished with their previous effort, still focusing their sound around strong guitar work and a strong sense of melody. It's not all good to be sure, but I think they are moving in the right direction here with plenty of memorable riffs and melodies. The title track starts the album off with some symphonic sounds that make you think that this will be an epic track. It is certainly epic in length at nearly 9 minutes. The opening riff is simple yet catches my attention with its sheer power. The song takes a bit too many twists and turns for my liking, but overall it's a decent song if you can sit through the whole thing. Once again the vocals are the high-pitched croons of Ari Koivunen. As I said about the last album, the vocals I know are going to be something that people really dislike. I personally don't find them to be bad, but his singing does leave something to be desired in terms of power and range. Wrapped In Barbwire starts off with some melodic guitar and heavy bass that gets some good energy going. I'm finding the production to be quite good, as it was on the previous effort. The bass is very rich and noticeable, but it does not drown the guitars out at all. However, the drumming is sometimes difficult to hear, though there isn't really much to hear in that department most of the time. Things Left Unsaid has some good guitar work and melody going on. I also like the addition of the growled vocals in this song, it adds some good contrast. (Won't Go) Home uses them too, though not quite as well; it sounds too much like a half-finished attempt at a melodeath track. The music simply is not intense enough to pull it off. Hours Of Simplicity starts off with more an 80s heavy metal sound than anything, but the chorus is slower and more melodic. I definitely noticed a lot of 80s heavy metal influence throughout this album, which, for the most part, worked well in terms of giving the album some strong, upbeat energy. Now sure all of this has been done before by various power metal bands, but I'll be honest, I like the sound presented here. It's a brand of melodic power metal that has more depth to it than much of what I've heard from this genre lately. Yes there are some negatives, such as some snore-inducing ballads (Closure and Wastelands are both pretty awful) and some very generic song structures, but there's also a lot of good. The thing that stood out to me the most, as you may have noticed, is the guitar work. It's really good, and has the potential to be great. Unfortunately I don't think these guys have it in them to create a truly unique sound like Angra or Dragonland. Nevertheless, this is still quite a good album, even after multiple listens, so I have to give these guys credit. They know what they're doing in this genre, and they are trying different things and finding out what works. I have a feeling they will keep it going and come up with something even better the next time around. A note for those in the U.S. - the album has not been officially released yet. The U.S. release is set for February 14, 2012 on The End Records.